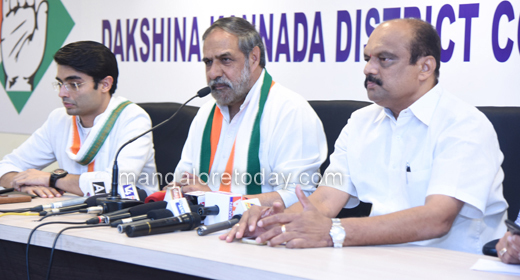 Mangaluru, May 04, 2018: Modi should come to Karnataka to apologise to the people for his unfulfilled promises rather than seeking votes, said senior Congress leader and former minister Anand Sharma. Speaking to reporters at the District Congress Office here on May 4, Friday, he said people of the nation are fed up with the BJP rule at the Centre and added that the people have been seeing Modi as the Prime Minister of the BJP since he won. Referring to rampant corruption, insecurity faced by women, massive unemployment and farmers’ problems as well as the allegations on BJP leaders, Anand Sharma said the BJP leaders are least bothered about the same. Ridiculing Modi, Anand Sharma requested him to share his business model so that the unemployed youth of the nation can become entrepreneurs like the son of the BJP President. He further accused the Prime Minister of misusing constitutional agencies to target opposition leaders. He asked the Prime Minister to speak more on corruption and employment issues. DCC Chief Harish Kumar and AICC National Media Panelist Jaiveer Shergil were also present.